The girls basketball team works with Tamika Raymond on drills and skills. 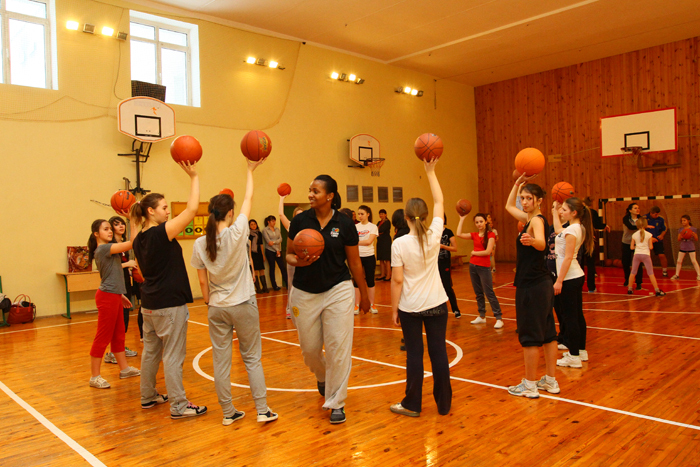 Girls from Ukraine pose with Tamika Raymond before a fast-paced basketball clinic. 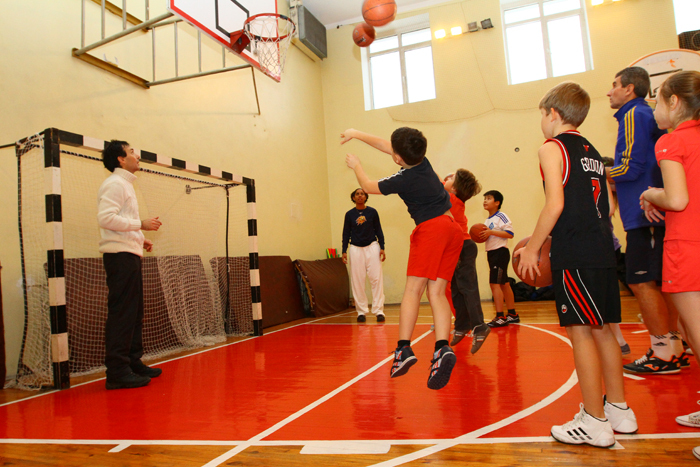 Young Ukrainian athletes learn new dribbling techniques during a fun basketball activity with Tamika Raymond. 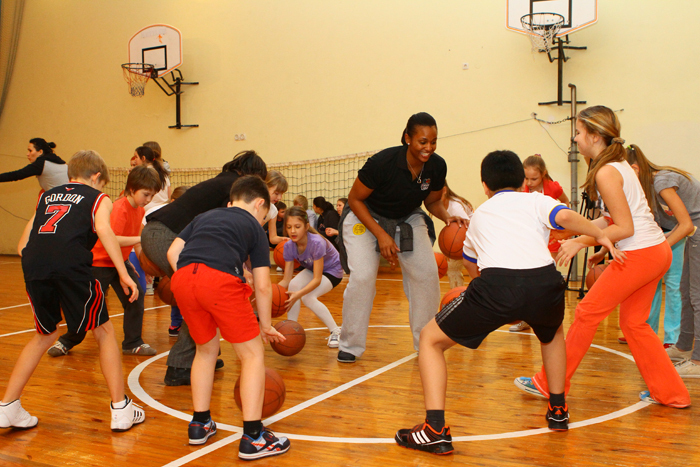 After autograph time, Tamika Raymond has fun with young Ukrainian basketball players. Sports Envoys Tamika Raymond and Nykesha Sales work with NBA representative Becky Bonner to lead an exercise focused exclusively on three-pointers. 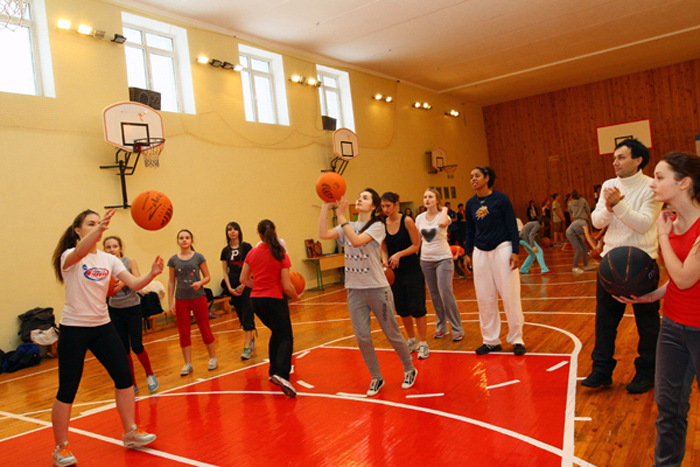 The WNBA Envoys teach the Ukrainian athletes a new basketball shooting game. A young Ukrainian female launches a shot during practice. The group joins together after the medley of clinics for a photo with the Sports Envoys. More skills and drills with the WNBA Sports Envoys. 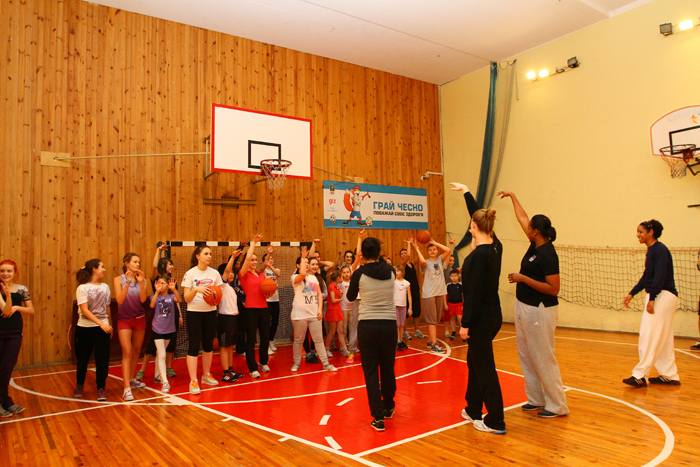 Nykesha Sales leads athletes during a shooting clinic while a Ukrainian coach observes to pick up on tips for the future. The State Department and NBA worked together to send former WNBA players Tamika Raymond and Nykesha Sales to Ukraine as Sports Envoys from January 28 to February 2, 2013. As a part of the Empowering Women and Girls through Sports Initiative, this program was designed to be one in a series of basketball envoy programs around the world. 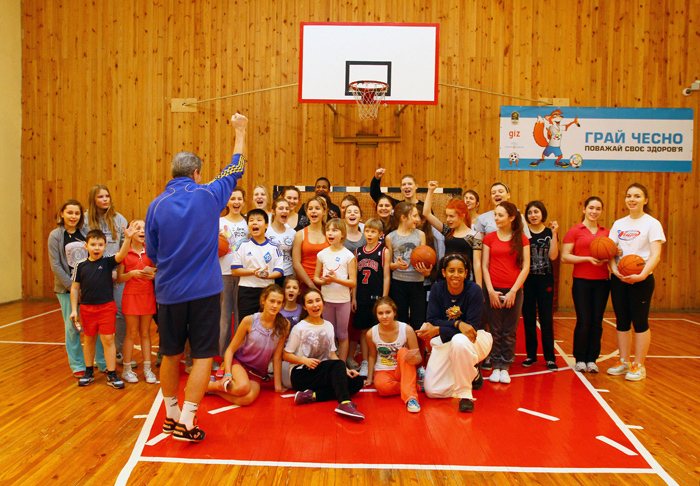 The exchange reached out to girls and female coaches in Kyiv and Donetsk through basketball clinics, a disability sports session, English language program, and activities with alumni from other State Department educational programs. They also met with students at a special school focused on sports and participated in interviews with local media. Throughout the program, the envoys highlighted the importance of Title IX in women’s sports throughout the program.